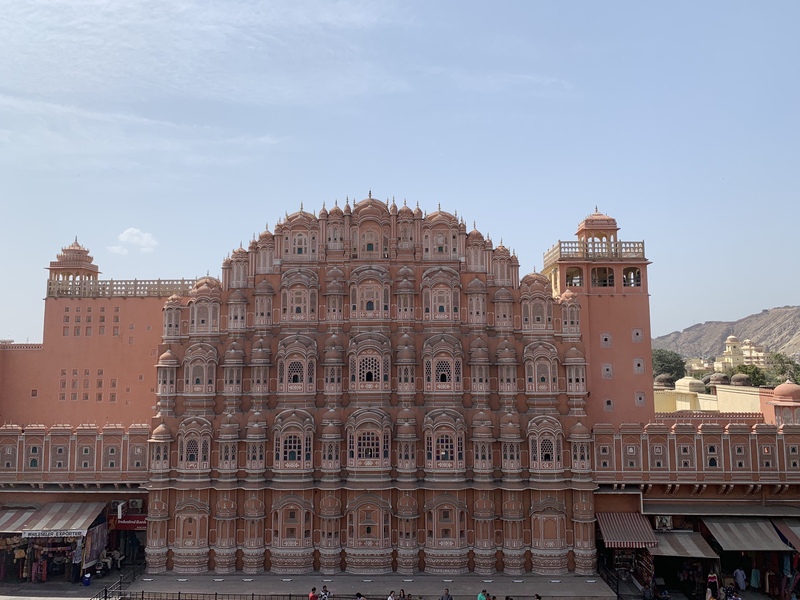 Known as the “Pink City of India” due to its distinctive pink coloured buildings, Jaipur is the largest city in the state of Rajasthan and one of India’s most stunning cities. You may be wondering why it is called the “Pink City,” and this is all down to Maharaja Sawai Ram Singh who had the whole city painted pink in 1876, to entice Prince Albert and Queen Victoria to visit Jaipur as part of their tour of India, as pink was considered the colour of hospitality at the time. 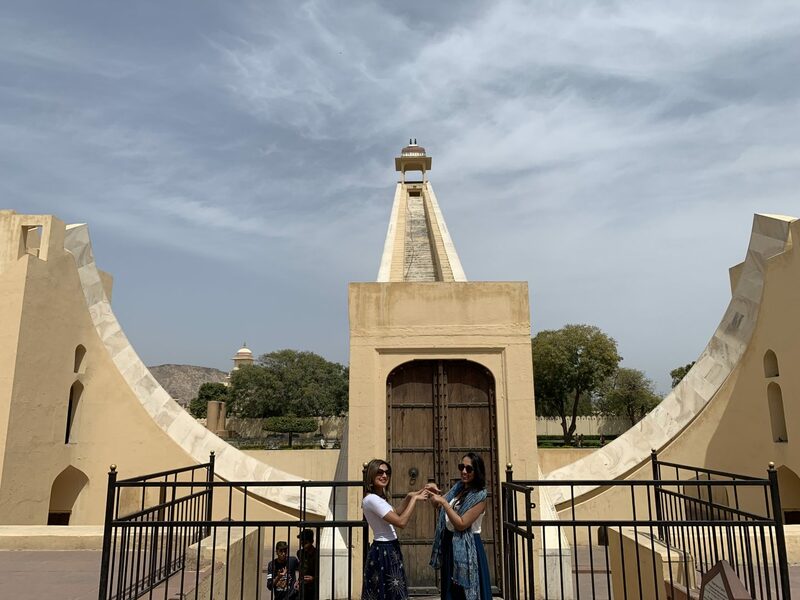 There is so much to see in Jaipur and it has an amazing variety of palaces, forts, temples, monuments, museums, arts and crafts, and various market places to explore. Established by Maharaja Sawai Jai Singh II, the City Palace was once the administrative and ceremonial seat of the royal family and is now a popular museum. The palace’s huge complex of courtyards, gardens, and buildings blends both Rajasthani and Mughal architecture. 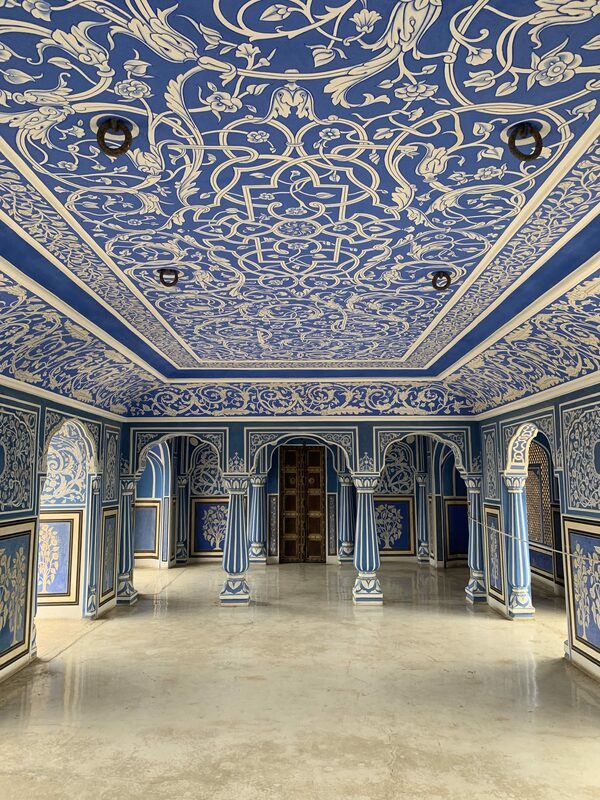 The descendants of the royal family still live in the Chandra Mahal, which is where the popular blue room, you may have seen all over Instagram is located, called Chhavi Nivas. You can visit this for an additional fee as it has a separate entrance to the main City Palace. The inner courtyard called Pritam Niwas Chowk at City Palace is worth a wander through to see the four gates representing the various seasons. Pictured is the Green gate, representing Spring, and dedicated to Lord Ganesha. Jaipur’s most distinctive and iconic landmark, the Hawa Mahal is an extraordinary pink-painted delicately honeycombed five-storey hive constructed in 1799 by Maharaja Sawai Pratap Singh to enable ladies of the royal household to watch the life and processions of the city through its 953 latticed windows. To get an alternative view, head to one of the rooftop cafes across the road, and enjoy a drink whilst you admire it in its entirety. 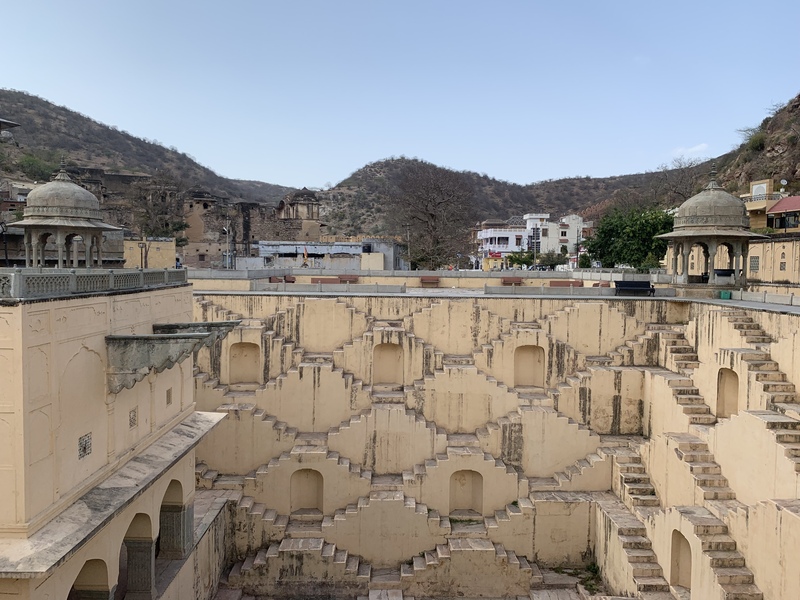 Built during the 16th-century reign of Maharaja Jai Singh, the Panna Meena Ka Kund stepwell was used as a way of collecting the monsoon rains and preserving water for the drier months. It is designed in such a way that people could reach water at any level as the pool rises and falls. The symmetrical arrangement of the stairs in a criss-cross manner, the recessed doorways and the octagonal gazebos make it sensational to see. It is located close to Amber Fort, so ideal to combine with a visit there. A visit to see the colourful Patrika Gate, the entrance to Jawahar Circle, a circular park in Jaipur, is a must! It is free to visit. Each pillar inside the structure is intricately hand-painted with important facts about different parts of the Pink City. The Jantar Mantar, in Jaipur, is one of 5 astronomical observation sites built in the early 18th century by Jai Singh. It includes a set of some 20 main fixed instruments. It is the most significant, most comprehensive, and the best preserved of India’s historic observatories. The shadows of the sun are used to tell the time and it can also identify planetary positions. Among the various stone instruments that Jai Singh had constructed is the Samrat Yantra, a 73-foot-tall sundial which remains the largest ever built. 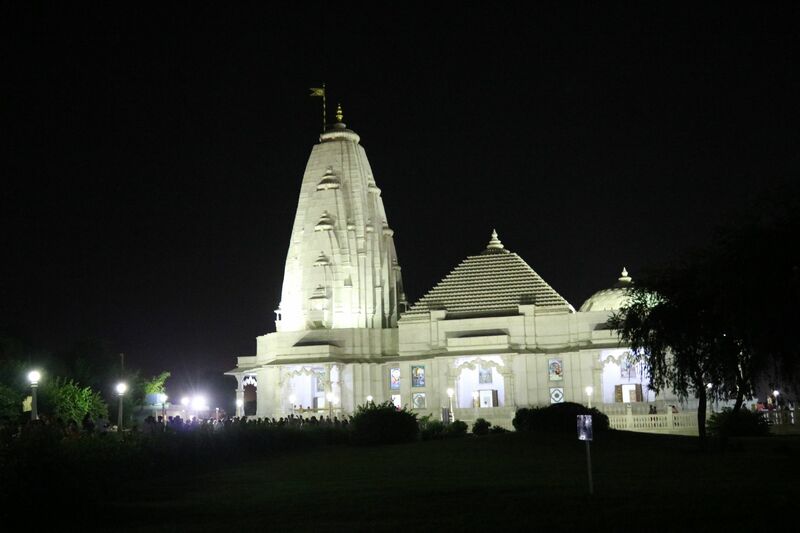 The Birla Mandir is a very famous beautiful temple dedicated to Laxminarayan and built entirely of marble and is visited by thousands of devotees every day. A visit during the early evening is recommended to see the stunning temple as well as attend the Arti Ceremony. 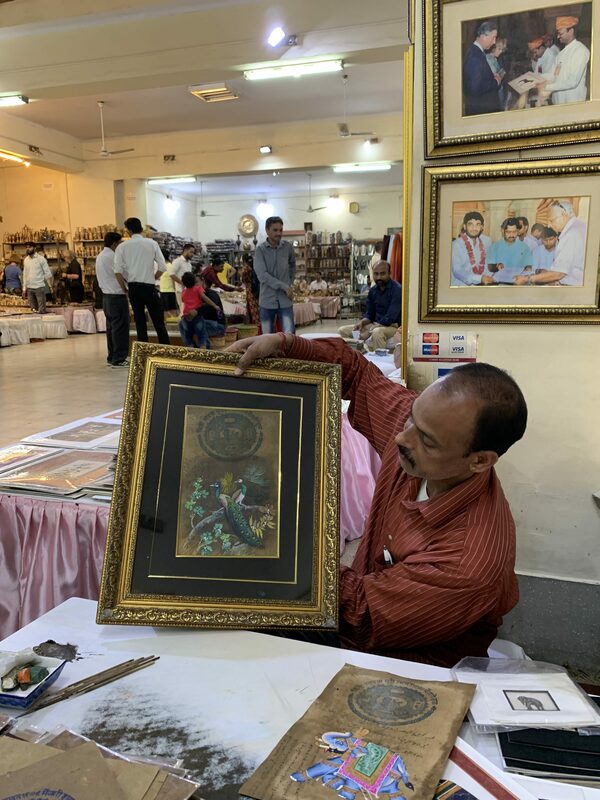 If you want to do some shopping whilst in Jaipur, head to Bapu Bazaar where you can buy a whole host of Rajasthani products ranging from clothes to shoes to jewellery, as well as decorative items, all in a bustling market setting. Hand Block Printing is a technique whose origin dates back to the 12th century with the skills being passed on from generation to generation. To create a design on material, different blocks are used to make up a particular print depending upon the complexity of the design and the number of colours desired in the finished product. It is an eco-friendly process that uses naturally prepared products and natural dyes. 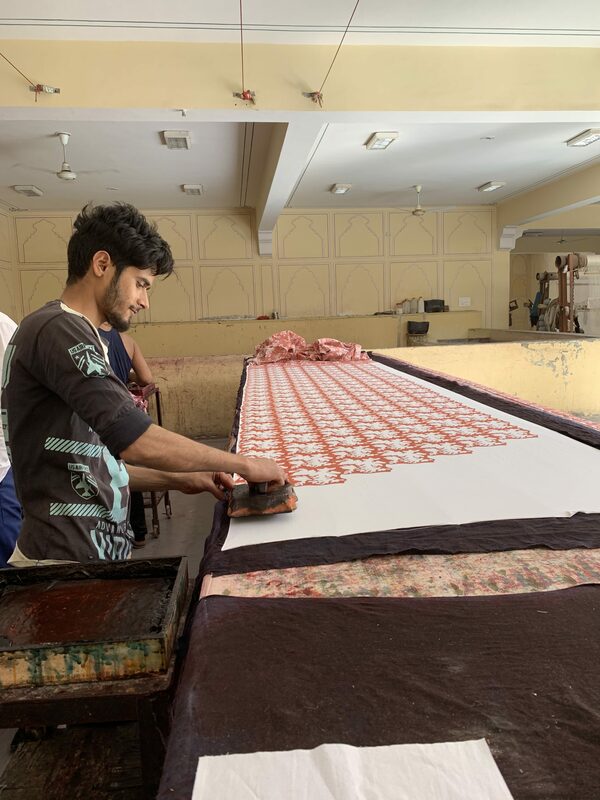 If you want to see it in action, visit the Jaipur Boutique Carpet & Valintino Textiles, where you can also see how carpets are made. 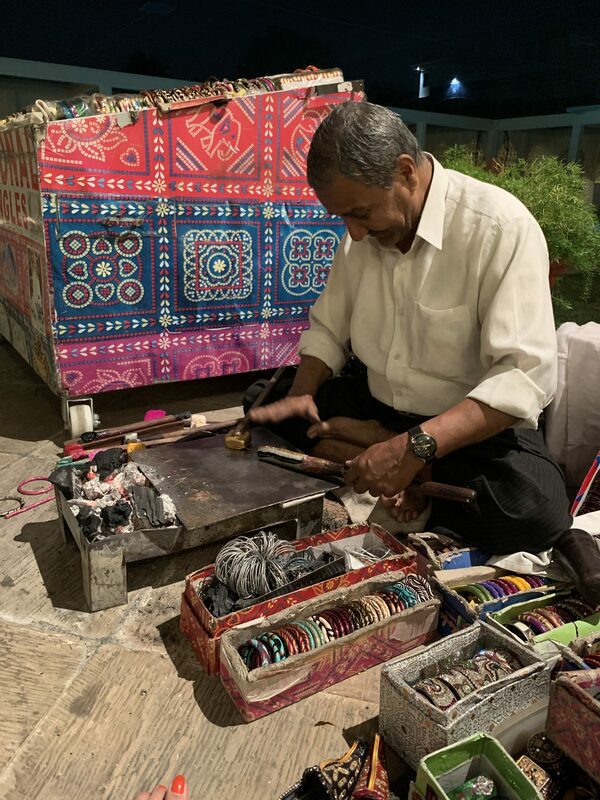 If you have the opportunity, the work of Ikram Ahmad, the famed master craftsman of Lac-bangles in Jaipur is fascinating to see. He learnt this craft from his parents who learned it from their parents, and he has even made bangles for the Queen! 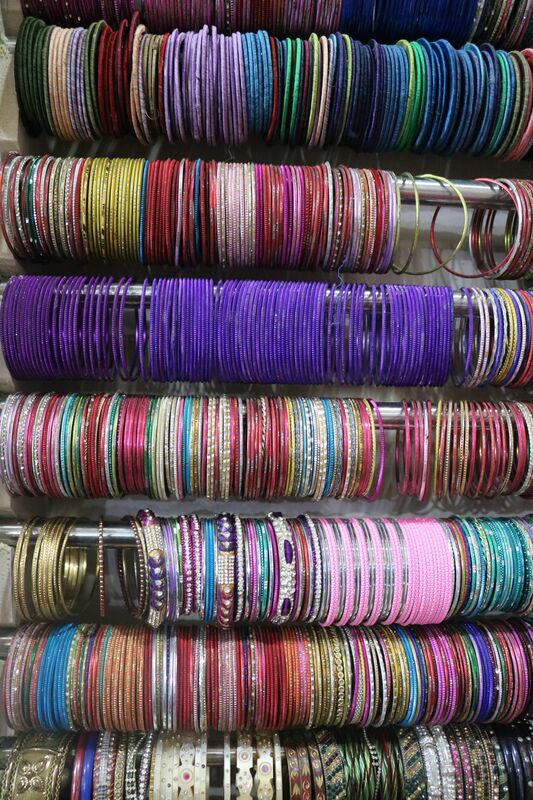 Lac based bangles are considered most sacred and mandatory for newly married women and the bangles are really durable. They can be made in an assortment of colours and have an amazing variety of embellishments. 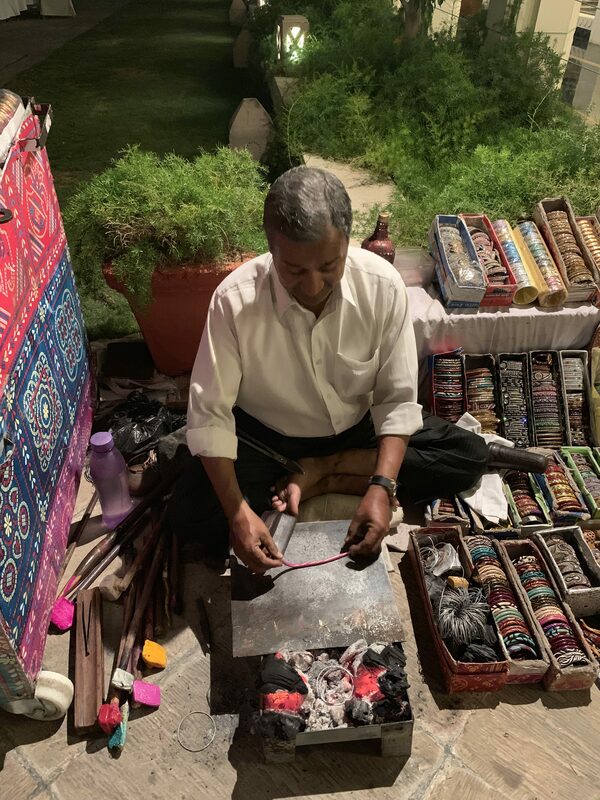 He can usually be found at the Trident Jaipur Hotel in the evenings, selling an assortment of bangles and can also make you bespoke ones upon request. It is interesting to see him making each bangle and he explains the process really well. 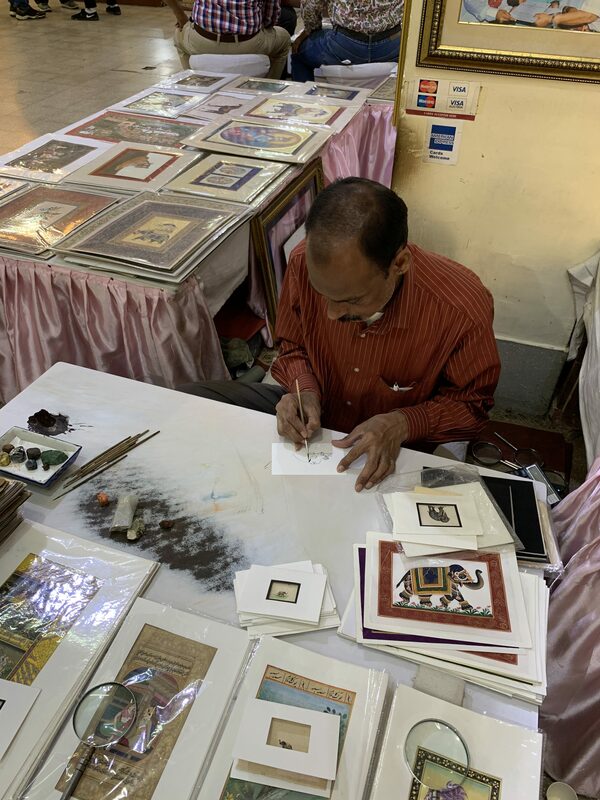 When visiting City Palace, be sure to have a look at the artists in one of the galleries who create Indian Miniature paintings, a renowned art stemming from the medieval history of India. This skill is passed on through generations. To create these murals and miniature paintings, zero number brushes made from squirrels’ hair are used and natural stone colours on handmade paper.